Astronomers have the strongest evidence to date that violent stellar mergers produce pencil-thin jets. This means that a majority of these events will not be detected because they will not be pointed where telescopes can detect them. This result has implications for estimating the number of such mergers that may detected with gravitational wave observatories. Chandra was used to study X-ray emission from the gamma-ray burst, allowing the width of the jet to be estimated. Gamma-ray bursts, or GRBs, are some of the most violent and energetic events in the Universe. Although these events are the most luminous explosions in the universe, a new study using NASA's Chandra X-ray Observatory, NASA's Swift satellite and other telescopes suggests that scientists may be missing a majority of these powerful cosmic detonations. On September 3, 2014, NASA's Swift observatory picked up a GRB - dubbed GRB 140903A due to the date it was detected. Scientists used optical observations with the Gemini Observatory telescope in Hawaii to determine that GRB 140903A was located in a galaxy about 3.9 billion light years away, relatively nearby for a GRB. 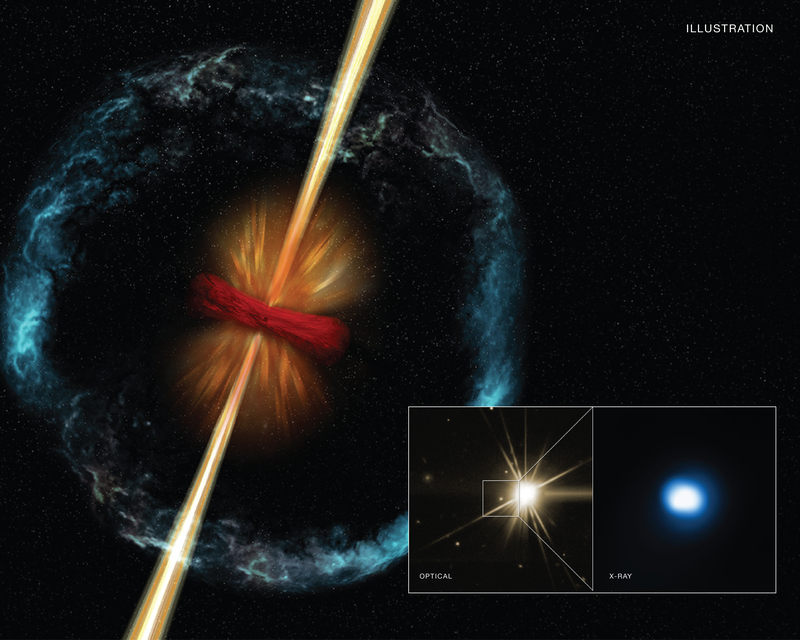 The large panel in the graphic is an illustration showing the aftermath of a neutron star merger, including the generation of a GRB. In the center is a compact object - either a black hole or a massive neutron star - and in red is a disk of material left over from the merger, containing material falling towards the compact object. Energy from this infalling material drives the GRB jet shown in yellow. In orange is a wind of particles blowing away from the disk and in blue is material ejected from the compact object and expanding at very high speeds of about one tenth the speed of light. Specifically, the researchers found that the jet is beamed into an angle of only about five degrees based on the X-ray observations, plus optical observations with the Gemini Observatory and the DCT and radio observations with the National Science Foundation's Karl G. Jansky Very Large Array. This is roughly equivalent to a circle with the diameter of your three middle fingers held at arms length. This means that astronomers are detecting only about 0.4% of this type of GRB when it goes off, since in most cases the jet will not be pointed directly at us. Several pieces of evidence link this event to the merger of two neutron stars, or between a neutron star and black hole. These include the properties of the gamma ray emission, the old age and the low rate of stars forming in the GRB's host galaxy and the lack of a bright supernova. In some previous cases strong evidence for this connection was not found. A paper describing these results was recently accepted for publication in The Astrophysical Journal and is available online. The first author of this paper is Eleonora Troja and the co-authors are T. Sakamoto (Aoyama Gakuin University, Japan), S.Cenko (GSFC), A. Lien (University of Maryland, Baltimore), N. Gehrels (GSFC), A. Castro-Tirado (IAA-CSIC, Spain), R. Ricci (INAF-Istituto di Radioastronomia, Italy), J. Capone, V. Toy, & A. Kutyrev (UMD), N. Kawai (Tokyo Institute of Technology, Japan), A. Cucchiara (GSFC), A. Fruchter (STScI), J.Gorosabel (UMD), S. Jeong (IAA-CSIC), A. Levan (University of Warwick, UK), D. Perley (University of Copenhagen, Denmark), R.Sanchez-Ramirez (Instituto de Astrof ́ısica de Andaluc ́ıa, Spain), N.Tanvir (University of Leicester, UK), S. Veilleux (UMD). Coordinates (J2000) RA 15h 52m 03.27s | Dec +27° 36´ 09.30"
Observation Time 22 hours 13 min. X-rays from the Chandra X-ray Observatory and optical from Discovery Channel Telescope. About 1.3 million light years. X-rays are blue and optical is yellow.